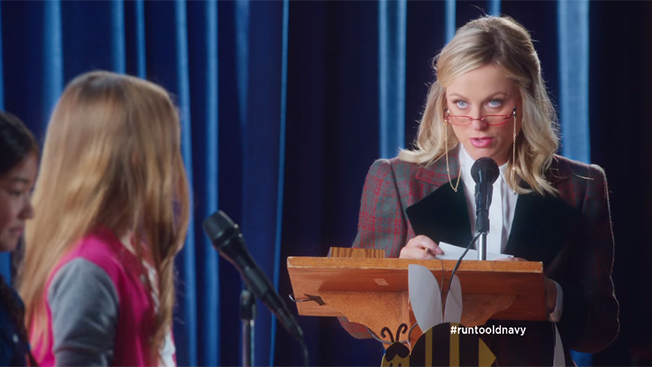 Amy Poehler goes to the top of the class in her latest Old Navy commercial, in which the Parks and Recreation actress moderates a spelling bee. Of course, we've seen her schtick for the retailer before, in ads where she's played, among others, a lawyer, politician, soccer coach and burrito server, all obsessed with the retailer's prices and fashions. Still, Poehler's sarcastic delivery never fails to please. Her snark is perfectly balanced by the fact that her characters aren't always thinking straight, their heads clouded by unnatural preoccupations with checked shorts, sleeveless jackets and such. We don't mind letting her have the last word, because we get the last laugh. At one point in this new spot from Chandelier Creative, Poehler misspells "four"—Old Navy's back-to-school sale prices start at $4—as "f-o-r-e." But that's OK. As she wryly notes in the amusing outtakes reel, "We have computers, who cares about spelling?"